ABOVE: A view of the narrow lane outside the apartment through the wrought-iron-and-glass door in the entrance foyer. The Santa Maria Formosa Apartment rents for less than the cost of a three-star hotel room, and the price (which depends on season and number of guests) includes linens and cleaning. 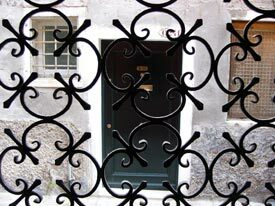 After Venere confirms your reservation, you'll receive an e-mail from the English-speaking landlady, who'll give you a number to call when you reach Venice. Upon your arrival, she'll meet you at the apartment, give you the key, and show you how everything works. When you leave at the end of your stay, you'll simply leave the key in the apartment and pull the self-locking door shut behind you.